Flat organizations are great. They put more people against the actual work of the company, and prevent unnecessary bureaucracy from forming around the products of the organization. But they don’t solve for progression. Undercurrent’s work is VERY flat. Our people are not differentiated much by output: at the end of the day the things we’re paid for are all findings, insights, and recommended actions, just delivered at varying levels of fidelity. When differentiation does occur, it’s usually along nuanced lines. A senior team member may have only two more years of experience than a junior team member, but they’ve seen more patterns, have a richer capacity for convincing a client, and probably a more finely tuned ability to integrate disparate ideas. Around two years ago, we realized that we needed to provide clarity around progression at UC and in the broader context of individual careers. For a variety of factors — one being that we hire entrepreneurial, inquisitive, ambitious types — we were getting a lot of questions about what comes next at UC. What’s required to make Senior Strategist? When should I expect a raise? What do I need to do to get better? How do the skills I’m building here contribute to my story as an individual? One of the first versions of the SMM. 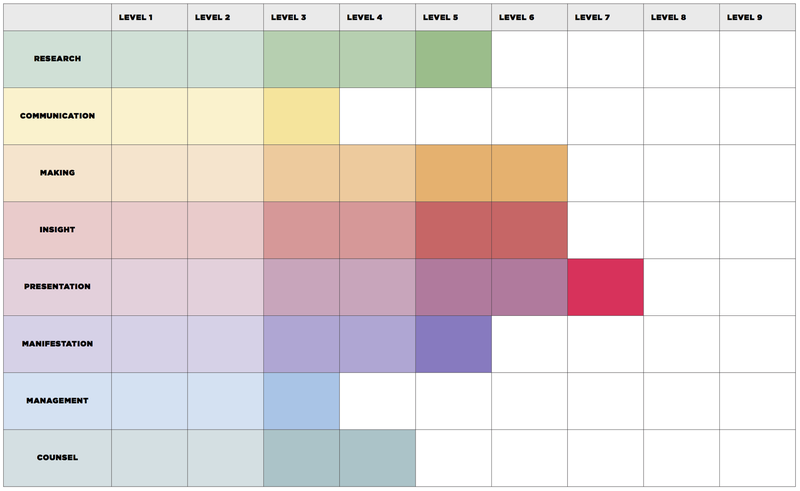 We created four levels of “Skills” that corresponded roughly to levels of achievement at UC, and then built out (really rough) maturity levels for each skill. Page 1 of three. As strategists, we figured the best way to solve these questions was with a framework. 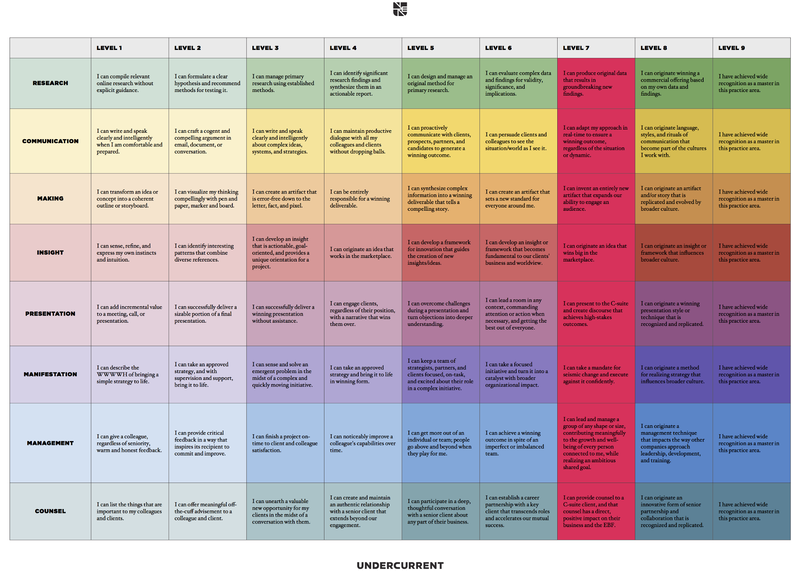 What follows is a description of the Undercurrent Skills Maturity Matrix (SMM). And while it’s not perfect by any means — we’re still working on it — it’s proven helpful for a number of user types, from Strategists to Managers to Clients. We tried more than a few schemes for organizing our thinking. 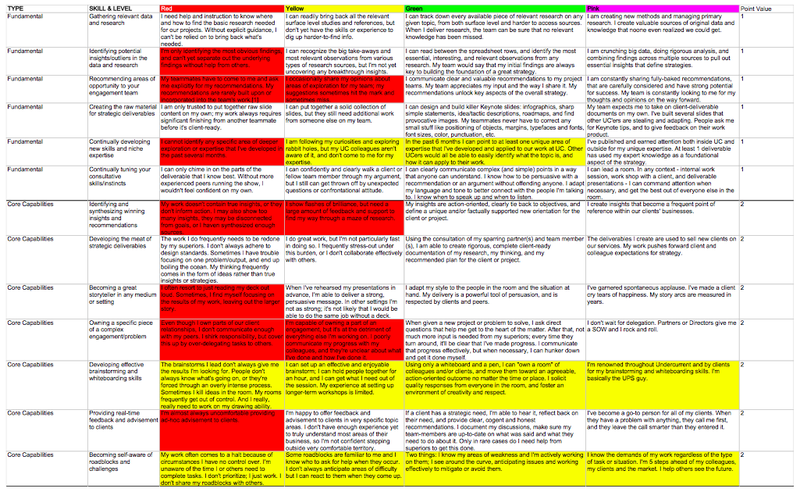 We started with existing job descriptions, and set Red, Yellow, Green and Pink assessments against each bullet point for each job description. We organized, clustered and connected each bullet point into paths toward a “complete” strategist, and noticed that the experience was non-linear. Some “requirements” for each level were more richly connected than others, and these were often informal gates to progression. While interesting, this still wasn’t clear or clean enough a solution. Eventually, we settled on eight core skills that represented the fundamental parts of a Strategist’s job, from figuring out what to do, to bringing it to life. Each of the skills has frame that holds a lifetime of work, where it would be possible for a person to focus on just one skill and build a successful career, if not as a consultant. In this way, the system that can work as a personal equalizer: it’s not important or possible to be good everywhere, and as a strategist, it’s not particularly effective to be too focused. To Mike Arauz’s point, we’re not actually looking for T-shaped people. We’re looking for square-shaped people. Further, the skills are organized according to a rough understanding of how they’re impacted by experience. For example, high-level skills like management and counsel are made possible by a lifetime of good research and communication. This is an equalizer for a particularly well-rounded Strategist. Research: Ability to extract the right information from the right sources with the right methods. Whether it’s through client-specific ethnography work, Buzzfeed, their walk to the office, or a 30-year-old text on organizational design, we want Undercurrenters to continually hone their ability to surface information that positively changes the direction of our output (and our clients). Effective structured and informal research is the foundation for a successful career as a strategist. Communication: Ability to effectively manage information flow in all settings. We need people to be able to communicate complex topics with radical clarity. Strategists need to be able to talk at a Kindergartner’s level about organizational design philosophy and go toe-to-toe with each other on the finer points of emergent internet standards, in person (verbally and nonverbally), in HipChat, via text, and through the inbox, without dropping any balls. Making: Ability to create work output, no matter the format. From Keynote to Scrollkit to events to software wrapped in plastic, our work needs to be delivered to clients (that’s how we get paid). We expect Undercurrenters to continually expand their toolkit, improve their output rate, and aim for one-take perfection. Insight: Ability to synthesize case history with internal taste, knowledge, morals, and patterns (value creation). This is the core skill of successful Undercurrenters and is what separates us from our competition; we can’t compete with much larger consultancies on certainty, but we can have better ideas for what to do with available information. We expect everyone on our ship to deepen their pattern reserves and develop their empathetic capacity so that their first idea is always a good idea. Presentation: Ability to successfully deliver Undercurrent’s message and work product in any setting. Every UCer, no matter their experience level, is expected to be able to present work to clients on their first day (and yes, that’s happened). Whether it’s over the phone or in person, one-on-one or to a group of thousands of mid-level-managers, we aim to have a team of strategists that can win over a room and change minds with a single presentation. Manifestation: Ability to realize the changes described in our strategic work. Throughout UC’s history, we’ve experimented with specific, differentiated Producer roles. Currently we expect all Strategists to develop their “production” skills alongside their “strategic” skills, because it’s hard to make good recommendations without having deep knowledge of the intricacies of implementing them in market. Further, because we don’t make anything internally, it’s crucially important that all our team members are able to make things happen with partners and clients. Management: Ability to foster strong internal and external teams capable of achieving our goals. This is a pretty traditional skill: managing the work-lives of colleagues. We believe great management is built on a few key capabilities: giving great, inspirational feedback; active improvement of colleagues’ skills over time; and constructing project rhythms that extract outsize value from each member on a team. It’s not about efficiency or Gantt charts, it’s about helping the people around you achieve more when you’re around than when you’re not. Counsel: Ability to advise senior-level clients on any portion of their business. The highest-level skill in a strategist’s arsenal is the long conversation, the multi-year partnership between client and counsellor. Over time, we aim to help strategists build relationships that foster change for individuals and organizations and that span paid engagements. The current edition of the SMM. Click to dive into the Google Doc. Done that a bunch of times? Have proof? Tick the box. Most maturity levels are intended to be either observable (you either have the relationships or you don’t) or suited for the honor system (if you can read the sentence to yourself and believe it, it’s probably true). In its current iteration, the SMM does not describe how to achieve the intended outcome, just that the outcome represents a particular level of achievement. It’s the tip of a really, really big iceberg that we continue to work through. 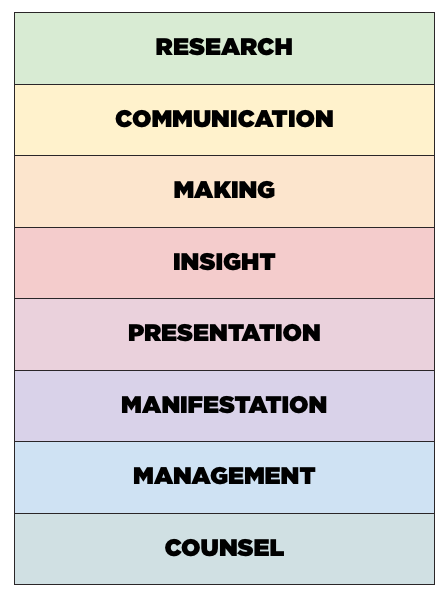 We created nine levels of maturity (nine different color belts in Karate, right?) and pegged level nine to total mastery of the subject, and level one to the most basic expectation for incoming team members. Level seven was set as “the best we can realistically hope for” at Undercurrent and provides a guide for what we hope everyone can achieve here after several decades of consulting senior-level clientele. And to be clear: we’re not laboring under the assumption that our Partners and Founders are all level seven and above. Everyone’s at their own spot on the equalizer in each skill, and that’s okay. With the SMM, we’ve defined two things: core capabilities required of all Undercurrenters, no matter their level; and development levels, defining progression throughout a career, no matter how long. With these two things in hand, Strategists are able to answer core progression questions without help from a parental/heroic manager. So beyond any additional potential functionality that might exist in a matrix like this, we currently have a way to help strategists at all levels mature their level of craft. With a more refined model, inclusive of self- and team-guided testing methods, we’d be able to truly quantify our work and understand how skills, maturity, experience and efficiency work together in a consulting environment. With this in hand, we’d be more effective in evaluating new hires, have “levels” set outside of hierarchy, and a rather interesting way to determine salary. At the very least, we’d be able to build higher-quality teams to tackle client problems. These are all things that we’re not pursuing now but may in the future as the SMM evolves. The career of an Undercurrenter is defined by curiosity and confidence, and tempered by self-doubt: at a young age, we expect our teammates to counsel CxOs and drive change, but we require humility before the work and we need people that are constantly improving. By providing and iterating on a guide for that self-guided improvement, we’re able to help young, motivated folks to level up in the areas that matter.